Surrounded by a vast and luscious Andalusian-style park, the Sofitel Rabat Jardin des Roses is a luxurious haven of peace and relaxation set in the heart of Rabat. Located in the citys most prestigious district, and within easy reach of its business centre, its the ideal place to sample legendary Moroccan hospitality in a beautiful and tranquil setting. 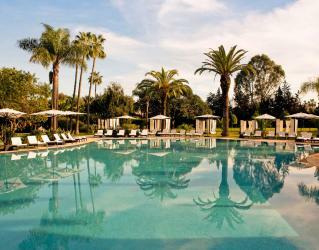 An oasis of relaxation and pleasure, The Sofitel Rabat Jardin des Roses is dedicated to satisfying your every need. It offers the perfect combination of state-of-the-art technology and traditional hospitality, so you can deal with any business matters quickly and easily, before sitting back and unwinding in enchanting surroundings. In short, excellence is at the heart of everything we do. 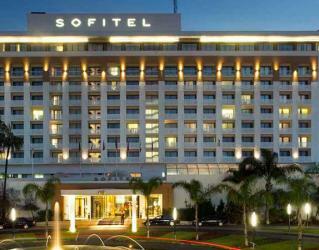 The hotel is located 10 minutes from the international Rabat/Sale Airport, very close to the town centre. Moderate and pleasant temperature all year round. Mild winters: average of 12°C in January. In summer, there's a cool breeze from the ocean: 25 to 30°C in August. 1 Imperial and 1 Royal suite. 229 rooms including 37 suites have been given the French touch by designer Didier Gomez, keeping to the spirit and design of the Moroccan palace. 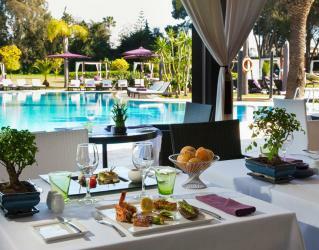 They offer the ultimate in luxury and are graced with views over the imperial city or the Andalusian gardens. 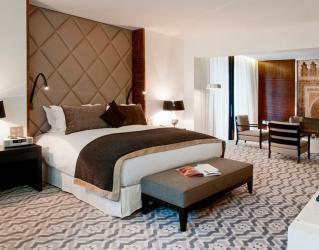 Our sumptuous Rabat suites invite you to relax with elegant lounges and exclusive butler service. 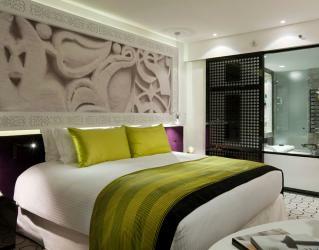 Opera, Imperial and Royal suites boast steam baths and kitchens too. Indulge in Club Millésime's private lounge with complimentary breakfast and snacks. 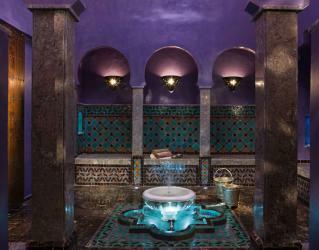 Among the facilities on offer are a traditional hammam (Turkish bath), spa and massages, 24-hour left-luggage room, parking spaces, valet parking, a business centre, Wi-Fi, a laundry service, 24-hour room service, and boutiques. 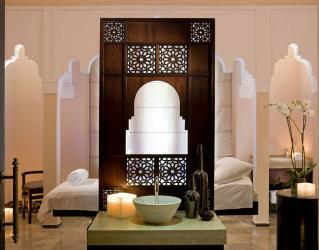 Whether you prefer to relax with a work-out at the gym or surrounded by the delicious scents of the hammam, the So SPA at the Sofitel Rabat Jardin des Roses is completely devoted to your mental and physical wellbeing. With a swimming pool, beauty therapy services, a sauna, gym and private Jacuzzi to choose from, there are many ways to help you feel refreshed and relaxed during your stay. 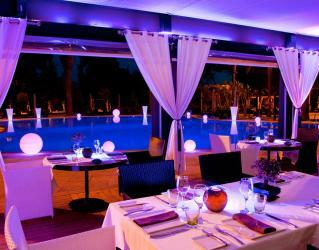 Three Rabat restaurants invite you to indulge. Moroccan flavors blend with French cuisine in gold-tinged Al Warda. Savor fresh Atlantic seafood at poolside Golden Fish. 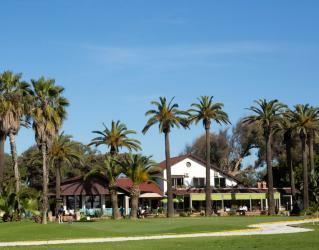 Taste Mediterranean fare in El Patio's deep red dining room with garden views. 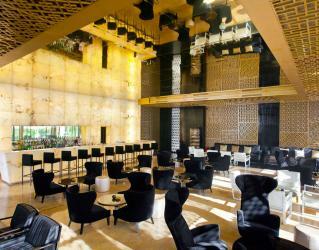 After a busy day sightseeing or in meetings, unwind in our two Rabat bars. 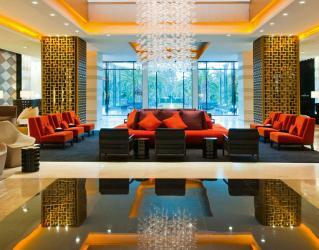 At Amber Bar, taste fresh fruit juice or perhaps a daiquiri infused with Morocco rose essence. Or chat over mint tea and a croissant among the artworks of Cafe Galerie.